Remodeling the most dated rooms in older homes makes a huge difference! My Curtice Cottage has been such a fun house to renovate and even more fun to enjoy living in. My previous two posts took you through the initial renovation ideas and projects, and walked you through my kitchen remodel with before and after photos. Kitchens and bathrooms are my absolute favorite rooms to remodel. In older homes, these two areas are often the most dated rooms and although they are expensive to remodel, it makes a HUGE difference in the look and value of a home when they are updated. The Curtice Cottage bathrooms and laundry room were renovated over a few months, often while working on other projects, and taking one room at a time since I lived in my cottage during the renovation. Since the spaces were already there, no walls or major construction was needed. 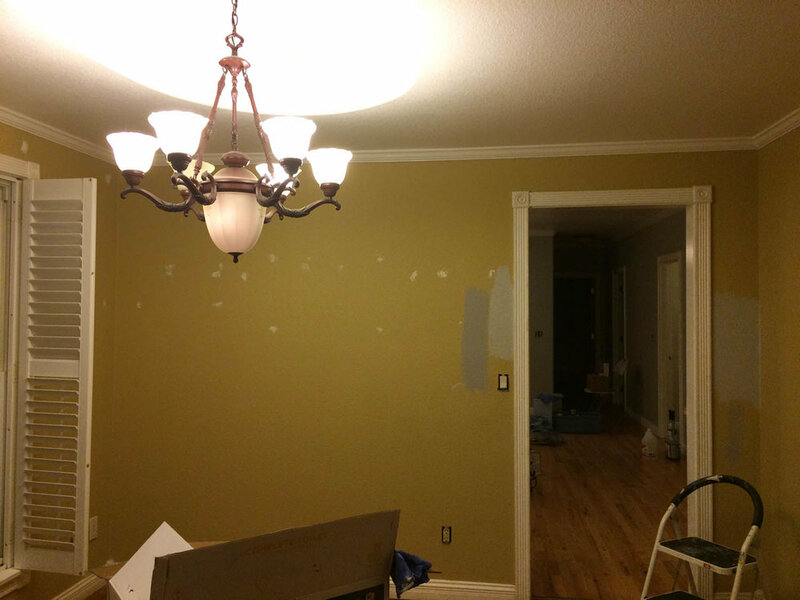 After painting the trim and removing some of the bath and laundry fixtures, I began my wallpapering task. For my bathroom, I was inspired by my pink front door that I'd bravely painted a few weeks prior. I've been so thrilled with the resurgence of wallpaper in the last few years and was delighted to find some choices that would brighten up my laundry room and master bath. 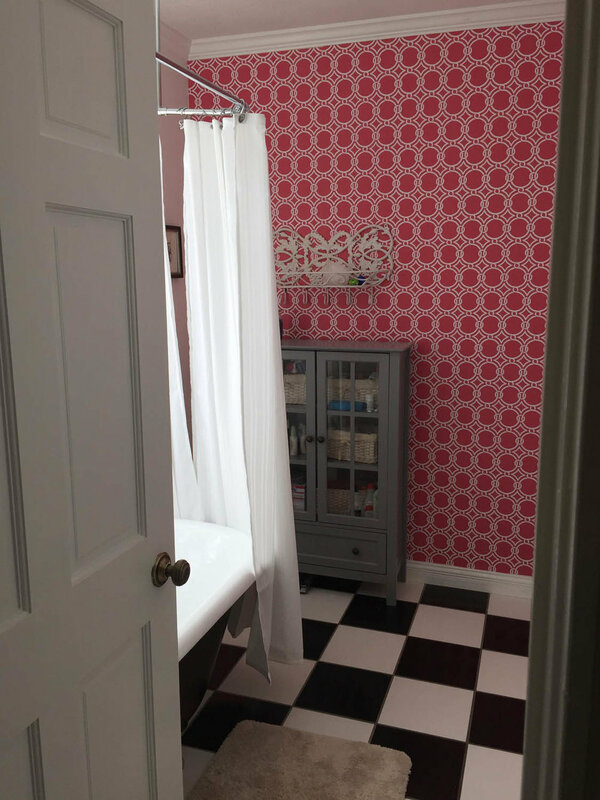 In my master bath, I chose a very bright pink lattice pattern which makes me so happy to look at every day. I only used it in part of the bathroom, as a bold accent, painting the surrounding walls a bright white. The result, with all my window light, is so fresh and feminine. And did I mention that I LOVE pink? I've wallpapered many many rooms in my lifetime and removed what seems like miles of dated wallpaper from other rooms. It's a chore, no doubt. The walls in my laundry and bathrooms needed to be skim-coated to smooth out the walls before the wallpaper was applied. The walls previously had a thick coating of shiny texture which would have resulted in a lumpy look and probably wouldn't stick very well. Since there weren't a lot of angles or tricky cuts on my walls, it was a one day job for each room. Once I got fixtures, appliances and lighting installed it made a huge difference and it was well worth the effort! What do you think? Have you taken on the laborious task of removing or adding wallpaper? I'd love to hear your stories and outcomes! Stay tuned for next week's post with the before and after reveal of Curtice Cottage and peeks into the rest of the house and outdoor spaces...here's a preview!